The ladybug, (Coccinella spp.,) also known as the ladybird and the lady beetle, was designated as the official state insect of New Hampshire in 1977. Ladybug Wins State Crown. 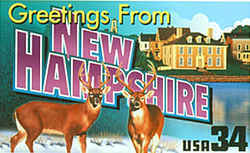 The 1977 Legislature voted the ladybug as New Hampshire's official state insect, in a history-making manner. The House of Representatives reversed an adverse committee recommendation on a ladybug bill, with a 185 to 135 standing endorsement. And then the Senate gave the measure such enthusiastic approval that all 24 members signed a copy of the bill, which was framed and presented to the Broken Gound grammar school of Concord, whose pupils sponsored the idea. The Ladybug is the Official State Insect of six states; New York, North Dakota, Ohio, Massachusetts, New Hampshire and Tennessee. The Lady Bug is the Official State "Bug" of Delaware. The Coccinellidae are a family of small beetles, ranging from 0.8 to 18 mm (0.0315 to 0.708 inches). They are commonly yellow, orange, or scarlet with small black spots on their wing covers, with black legs, heads and antennae. Such colour patterns vary greatly, however; for example, a minority of species, such as Vibidia duodecimguttata, a twelve-spotted species, have whitish spots on a brown background. Coccinellids are found worldwide, with over 5,000 species described, more than 450 native to North America alone. It helps farmers by controlling insect pests, especially aphids. In folk medicine, ladybugs were believed to cure various diseases such as colic and measles. 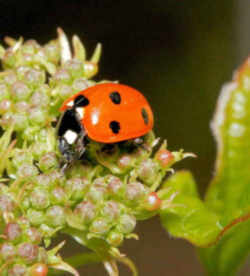 In folk medicine ladybug beetles were used to cure various diseases including colic and the measles. Adults: The life cycle is about four weeks as the ladybug larvae passes through four growth stages feeding on insects and insect eggs. The reddish-orange ladybug has distinctive black spots on each wing cover. 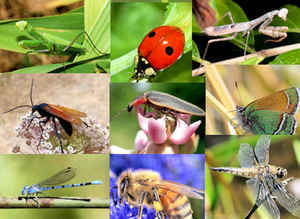 Defense: Bright colors generally indicate that the insect is armed and dangerous! In this case the ladybird is advertising it's bitter taste. When handled the ladybird will exude drops of pungent fluid which stain the hand and taint it with a long-lasting smell. 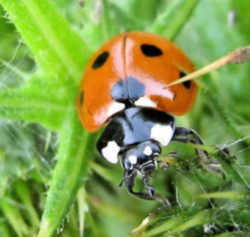 Ladybugs are the most popular and widely used beneficial insects for commercial and home use. Ladybugs are capable of consuming up to 50 to 60 aphids per day but will also eat a variety of other insects and larvae including scales, mealy bugs, leaf hoppers, mites, and various types of soft-bodied insects, and are one of the most active predators, searching from dawn to dusk for food. Ladybugs will consume over 5,000 aphids each in their lifetime. Pollen and nectar are necessary for maturation of newly emerged ladybug adults, particularly before a winter hibernation season. Adults can survive on pollen and nectar for limited periods, but a supply of aphids or other prey is necessary for egg production. Ladybugs become active at about 59 degrees Fahrenheit. Ladybugs are cold-blooded and hibernate in cold weather. There are nearly 5,000 different kinds of ladybugs worldwide - 400 of which live in North America. A ladybug's top flying speed is about fifteen miles per hour. Ladybugs lay their eggs where aphids are present. Both lady bugs and their larvae eat aphids. The eggs of ladybugs are not visible to the naked eye. A female ladybug will lay more than 1000 eggs in her lifetime. Ladybugs are a type of beetle. All species of ladybugs have short legs. This separates them from other beetles. A ladybug excretes a yellowish liquid when it is threatened. The liquid has a terrible smell to its predators. The Asian Lady "Beetle" can live up to 2-3 years if the conditions are right. It was the boys and girls of Grade 5 of the school who launched the ladybug project, out of their social studies, before the 1977 legislators. They had studied it the previous year, according to Mrs. Marilyn A. Fraser, their teacher, and developed lobbying plans to woo support of the incoming lawmakers. Details of this successful sponsorship of a new law by a group of school children are without precedent. First off, they turned to the two legislators of their East Concord district, Representatives Polly B. Johnson and Robert J. Watson, to sponsor their ladybug bill. They also collected the signatures of 100 citizens and other classmates, to support their venture. The committee was most favorably impressed with the enthusiasm, intelligence and research done by the members of the 5th grade of the Broken Ground School of Concord, and with the merits and capabilities of the "ladybug." 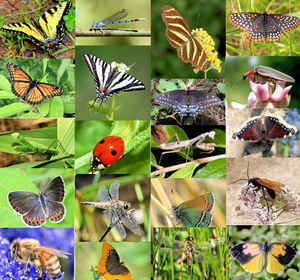 With such an important consideration as the adoption of a state insect, the committee felt it appropriate to recommend the appointment of a "State Insect Selection Board," so as to broaden the scope of the search for a state insect by hearing from other groups, who may champion other beneficial insects. The ladybug is already the state insect of at least three other states. The amendment establishes such a Board, consisting of one Representative, one Senator, two members appointed by the Governor and Council, chaired by the state entomologist. The strange committee recommendation went before the House on March 3, and was approved by the legislators, without discussion. But then Ednapearl Parr of Hampton, a committee member, challenged the approval vote, took the floor to argue for passage of HB 259 in its original form, and demanded a showdown standing vote. Chairman Richardson D. Benton (of Chester) of the CMVA committee spoke against Mrs. Parr's demand for reconsideration. So did Ashton J. Norton of Hampton, a committee member, and Elaine T. Lyons of Merrimack. Mrs. Johnson and Francis A. Dostilio of Keene joined in the reconsideration maneuver, whereupon Speaker Roberts put it to vote, and the ladybug bill was resurrected by a decisive 185 to 135 division tally. Mabel Richardson of Randolph next moved that the ladybug bill be "tabled," which meant indefinite postponement, and she was shouted down. Finally, George A. Barrus, Cornish farmer and lay clergyman, called for formal approval of the ladybug, and the bill was passed and sent to the Senate for concurrence. Flattering Senate Approval. The ladybug, sometimes called the ladybird, was given flattering Senate endorsement. Senator Mary Louise Hancock of Concord became a prime sponsor in the upper branch, as Mrs. Johnson won the support of the New Hampshire Federation of Garden Clubs for the ladybug. 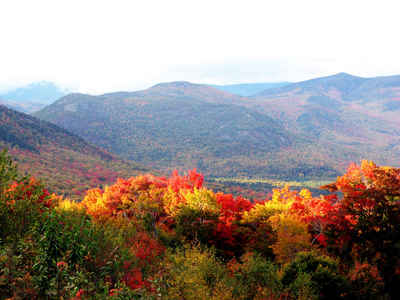 President Alf E. Jacobson referred the ladybug to the Senate Committee on Environmental Control, and its chairman, Phyllis M. Keeney of Hudson promptly got in touch with the Broken Ground School Sponsors for a friendly hearing on their proposal. The committee then filed an "ought to pass" recommendation on April 6, whereupon the Senate gave the ladybug its unanimous approval. On April 12, the Senate was informed that HB 259 had been enrolled in permanent form and sent to Governor Meldrim Thomson, Jr., for his signature. He signed the ladybug into law on April 15, to become effective 60 days later, which fell on June 14, the annual national Flag Day anniversary. As the ladybug became New Hampshire's official state insect; research disclosed that Massachusetts, Ohio, and Tennessee had already adopted the ladybug as their state insects. In an unprecedented legislative compliment, Senator Hancock induced her 23 Senate associates to join with her in attaching their signatures to a copy of the ladybug bill, whereupon she had it framed and presented to the young sponsors for permanent display in their school. The ladybug is a tiny, multi-colored, fast-flitting insect, which was described by its sponsors as shaped "like half of a pea, and often having red, white and yellow spots. Ladybugs feed chiefly on plant lice and scale insects. For this reason, fruit growers find ladybugs helpful." The pupils also testified that the ladybug is a sign of good luck, and that most folks are always careful not to harm one. The law designating the ladybug as the official New Hampshire state insect is found in the New Hampshire Statutes, Title 1, Chapter 3, Section 3:11. 3:11 State Insect. - The ladybug, also known as the ladybird and the lady beetle, is hereby designated as the official state insect of New Hampshire. Source. 1977, 62:1, eff. June 14, 1977.